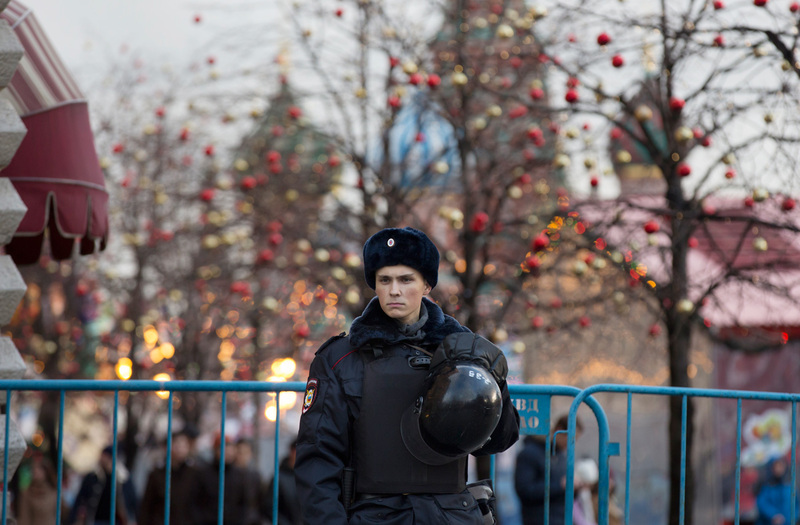 A police officer guards an entrance at Red Square, illuminated to celebrate the upcoming Christmas and New Year, in Moscow, Russia. Moscow police are to use trucks to block vehicular access to sites in the Russian capital where holiday festivities will be taking place after the recent terrorist attack in Berlin. Moscow police will use trucks to block the entrances to sites of mass gatherings during the New Year's holiday festivities in order to avoid trucks being used in terrorist attacks like those in Berlin and Nice, the head of Moscow's traffic police Viktor Kovalenko has said. The unusual security measures will be introduced in relation to the terrorist acts in Germany and France, in which a total of 98 people died under the wheels of trucks driven by terrorists. "We understand and see the events happening in the world. Including the events in which trucks are used. Therefore we would like to avoid any preconditions," RIA Novosti cites Kovalenko as saying. In Kovalenko's words, other security measures will also be strengthened. Large interchanges will physically be closed and in entrances to the city vehicles will be subjected to selected inspection to see if they are carrying weapons. The terrorist who rammed a lorry into a Christmas market in Berlin on Dec. 19 killed 12 people and wounded 48. A similar terrorist act occurred on the Promenade des Anglais in Nice in the summer, killing 86 people and wounding 430.